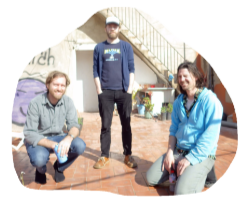 The Undergrowth Collective are a group of Bristol musicians with a lot to say and an off kilter way of saying it. We release records and put on a regular night at The Greenbank Pub, Easton, the third Wednesday of every month. If you like your music lyrical, hypnotic, surreal, crafted, door slammingly punk, toe tappingly pop or launching paper airplanes through the skylight at the moon folk-ish. Then you're in the right place. Dive into the long grass. And take a swim. The Woodlice play ace punk folk pop. The band started off as troubadours and then evolved into a punkier pop outfit lying somewhere between Violent Femmes and leftfield folk. Jet and the band have had airtime on BBC 6 Music and toured the UK. Jet McDonald on lead vocals and guitar. Simon Van der Linden on Bass. Mark Gonsalves on drums. Snails are a 5-piece experimental pop band from Bristol, stealing gleefully from mavericks such as the Kinks, Lou Reed and Syd Barrett while combining it with a deft lyricism and craftsmanship all their own. Songwriter Dan Weltman studied film music composition at Bristol University, and draws on folk, classical and pop influences in his writing. He is joined by Anna Kissell (vocals), Holly McIntosh (bass, vocals) Steve Dixon (drums) and Matthew Chaney (keys). Jet McDonald plays folk tunes that soar and drop like a hanglider with a rusty screw. As lead singer with The Woodlice, with Simon Van der linde and Mark Gonsalves, he knocks out tunes with a poppier punk feel. Jet and the band have featured on BBC 6 Music and toured the UK. When not writing and playing songs Jet is thinking up surreal fiction, writing books on cycling and philosophy and short stories for performance. Dan Weltman is a songwriter, multi instrumentalist and producer. He crafts songs with a classic English, psychedelic feel and lyrical blues that sound like they were born a long time before he was. He lends his guitar, violin, mandolin, uke and banjo playing to more bands than we can mention. He currently leads alt pop heroes, Snails, as heard on BBC6 Music, and plays olde time with The Ninetree Stumblers. His first solo release “Inside the Wolves” had top notch reviews all over the place, including Laura Barton at The Guardian. Dan sometimes plays violin with The Woodlice and whatever’s lying around with Andy Skellam. Andy Skellam writes and plays extraordinary songs that will gather you in and then unravel you like the thread of your favourite jumper. His music has been described as “fractured ice blues melting into fireside folk” and “the soundtrack to resting on a broken tree in mulchy woods”. He has toured all over the UK and Europe, supporting bands like This is the Kit and Rachael Dadd. He is also a painter, illustrator and pied piper to the party over the hill. Shorley Wood is Greg Ashby and all who sail with him, musically speaking. He is a bit of a legend amongst his peers and all who have a chance to catch him. A songwriter of lyrical, transcendent songs, his recordings are infrequent. But each one is a gem. Greg released a 6-song EP called 'Greg's Song' some years back and one of the songs on it - Fighting Talk - was later covered by This Is The Kit and electronica act JayetAl. 2015 saw the release of a new 6-track EP, 'Lo-Fi / No-Fi Lullabyee,' recorded with the help of good friends Matt Douglas and JayetAl, along with all of Greg's family. The song "Motherland" was played repeatedly by Gideon Coe on BBC 6 Music. Red Deer Sleeping (Mog Fry & Simon West) play elemental nature inspired songs on ukulele and cuatro, based on poems by the imagist poets of the early 20th Century - including Amy Lowell, D H Lawrence, T.E. Hulme and Victorian & Romantic poets. Mog Fry (also of The Wraiths with Spiro's Jon Hunt) has a voice of rare purity and clarity that brings an understated power and enchantment to her songs. Dan Bendel produces many of Undergrowth's posters for their regular live night and designed the Undergrowth logo on the welcome page. He is a Bristol based woodcarver and graphic artist.